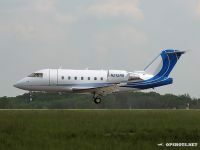 The Challenger 604XT: Nextant’s New Project » OPShots.net - Cyberhub to Cleveland Aviation and the World! AIN – The Bombardier Challenger is Nextant Aerospace’s next remanufactured aircraft program, company executive vice president Jay Heublein revealed at the 2017 European Business Aviation Convention & Exhibition (EBACE). However, unlike Nextant’s 400 XTi (Beechjet) and G90XT (King Air 90) that were launched as complete tip-to-tail remanufactured aircraft programs, the 604XT was announced first as an avionics retrofit package, with more details to come in October at the National Business Aviation Association (NBAA) Convention about what cabin, aerodynamic, or engine upgrades would be part of the remanufactured end-product. 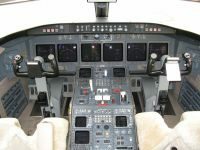 According to Heublein, the decision to hone in on avionics—in this case a Rockwell Collins Pro Line Fusion retrofit done in coordination with the avionics manufacturer and Bombardier—is based on providing a NextGen-capable cockpit upgrade for Challenger 604s in time to meet rapidly approaching mandates, such as FANS, ADS-B OUT and LINK 2000+. “What we found was that a high number of Challenger 604s are being used to fly North Atlantic routes, which means they will have to comply with the upcoming FANS and LINK 2000+ mandates to keep flying these routes,” said Heublein. “Considering normal maintenance costs for the Challenger’s CRT-based Collins Pro Line 4 system and these necessary avionics upgrades, we estimate that operators will have to spend about $680,000 over the next three to five years. Looking beyond the urgent need for avionics upgrades, Heublein said that the in-service fleet of 360 Challenger 604s will be due for heavy structural inspection schedules in the coming years. This combination of a large in-service fleet, avionics obsolescence, and nearing heavy inspections made the twinjet an excellent candidate for remanufacturing, he noted. Other than showing a computer-generated concept cabin for the 604XT, Nextant was scant on details about what will be addressed in the remanufacturing program. The 400XTi and G90XT programs included complete cabin refreshes, aerodynamic improvements, and re-engining, but it’s unknown if the 604XT will be quite as extensive. However, he mentioned that Nextant would like to increase the service ceiling of the airplane and address issues with the wing, but stressed that nothing is yet set in stone. 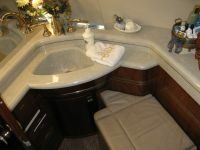 O’Donnell confirmed that the 604XT will come with a new cabin and the Rockwell Collins Venue cabin management system. “We’ll have more to say about the 604XT in October at NBAA,” he promised. Welcome to OPShots.net! Enjoy the photos!